Did body armour really help? Many dinosaurs had some protective armour, but the ankylosaurs were the most heavily armoured of all. Some were covered in a mosaic of bony plates and studs, and many bristled with spines and spikes, too. Only their bellies were unprotected, and ankylosaurs may have crouched to avoid exposing them when attacked. It would have taken a hungry theropod to tackle spiky Gastonia, which may have responded by driving its shoulder spines into its attacker’s leg. What was the armour made of? 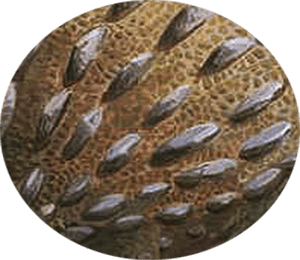 The flat plates embedded in the skin of the ankylosaurs are known as scutes by palaeontologists. 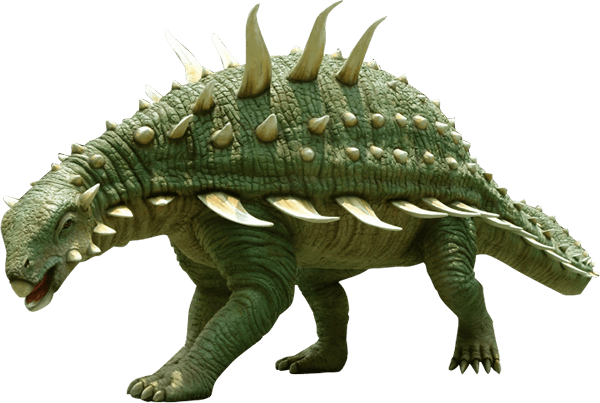 The ankylosaurs’ armour of scutes, studs, and spikes was made of hardened bone, sometimes covered in horn. 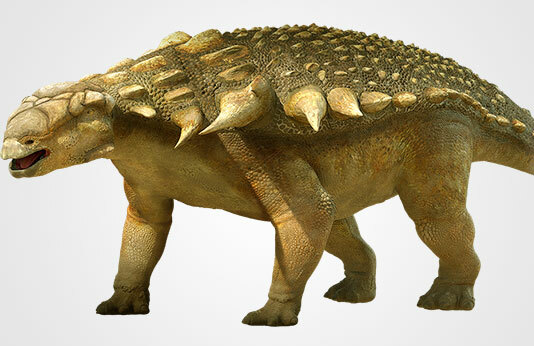 Edmontonia had scutes around its shoulders and along its tail, as well as triangular spikes on its back. What was a nasal boss? 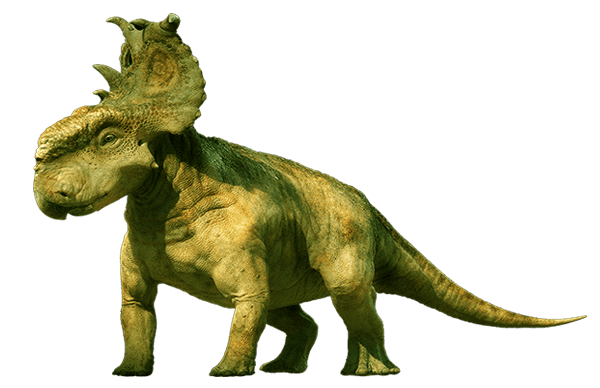 One of the horned dinosaurs, Pachyrhinosaurus, has a name that means “thick-nosed lizard”. On its nose – where its cousins had a sharp born – Pachyrhinosaurus had a big bony knob. This was the nasal boss. Rival family members may have scrapped with each other, using their nasal bosses as weapons. Recent research has shown that the skin on the back and tails of some of the ankylosaurs was virtually bullet-proof – and certainly tooth-proof. The big scutes, smaller irregular plates, and the hexagonal plates interlocked to make the skin so tough and light that experts have likened it to fiberglass. Pachycephalosaurus was an ugly beast. It had a dome-shaped head edged with horny bumps, and several short bony spikes on its nose. 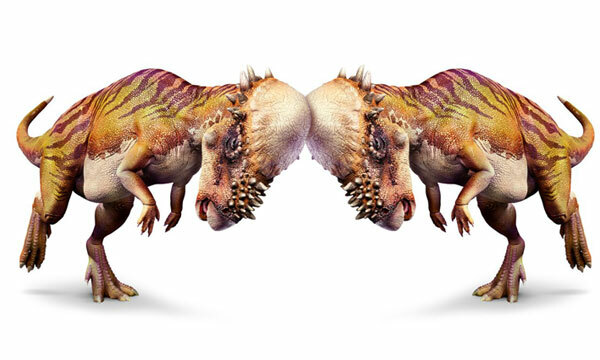 The dome was made of solid bone, which as a shopping 25cm (10in) thick; Pachycephalosaurus may have used its head as a battering ram against attacking predators – or each other. Although most of the sauropods relied on their size to defend themselves, some of them were lightly armoured too. Saltasaurus had two types of armour. Its back and neck were covered in fist-sized bony scutes, and much smaller lumps toughened the skin all over its body. Some ankylosaurs were so well-protected they even had bony eyelids. 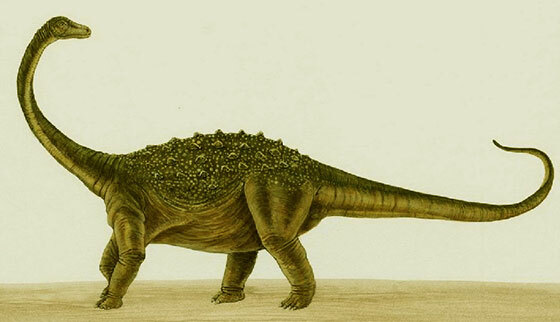 Dinosaur remains were first found in Antarctica in 1986, with the discovery of the bulky ankylosaur Antarctopelta. Psephoderma was a marine reptile. 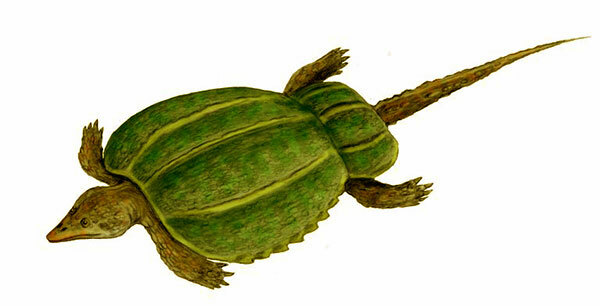 Its body was covered in heavy hexagonal plates, like a modern turtle.